The Mercedes-Benz Vito is a light commercial van (M) produced by Mercedes-Benz. It is available as a standard panel van for cargo (called Vito), or with passenger accommodations substituted for part or all of the load area (called V-Class or Viano). 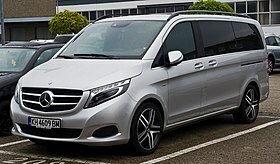 The V-Class/Viano is a large MPV. The first generation went on sale in 1996. The second generation was introduced in 2004, and the vehicle received the new Viano name. In 2010, the vehicle was facelifted with revised front and rear bumpers and lights. The interior was also improved with upgraded materials and new technology. The third generation was launched in 2014 and returned to being called V-Class. The first generation Mercedes-Benz Vito was produced between 1996 and 2003. It is powered either by a diesel engine with up to 120 bhp (89 kW; 122 PS) or a gasoline engine with up to 140 bhp (104 kW; 142 PS) and a front-wheel drive drivetrain. The range of gasoline engines consists of two old units from Mercedes (113 and 114) and a Volkswagen 2.8 VR6 engine, designated as the M104.900. When it comes to diesel engines, old 2.3 with and without turbo and also modern CDI 2.2 engines are available. This body design was also sold as the V-Klasse in more luxurious version (V-Klasse was replaced with the Viano-name for the second generation of Vito). It was designed by Michael Mauer from 1989 to 1991, when the final design was chosen and patented in February 1993. Six or seven seats come as standard in most markets. The Viano can be turned into an eight-seat people carrier by fitting two three-seater benches in the rear. All rear seats slide in 1-inch (2.5 cm) increments, recline and can be turned to face one other. They can also be folded down or removed completely to increase the load capacity. A rear folding table is standard in six- and seven-seat layouts. The rear seats cannot be folded into the floor like on some rivals. With all the seats removed the Viano Extra-Long can accommodate up to 4,610 litres (163 cu ft) of cargo with a payload of 930 kg (2,050 lb). It can tow a 2,500 kg (5,512 lb) braked trailer and a 750 kg (1,653 lb) unbraked trailer. An adjustable self-levelling rear suspension is included on higher specification models. Rear-wheel drive allows the Viano to have a smaller turning circle than front-wheel drive rivals; Compact and Long models have a turning circle of 11.8 m (39 ft) whereas the Extra-Long model turns in 12.5 m (41 ft). Japan passenger models were sold as the V-Class, as the V 350. Early models included V 350 Trend (RHD), V 350 Ambiente (RHD), V 350 Ambiente long (RHD). In 2012, Mercedes-Benz released the Valente model in Australia to sit beneath the Viano as the entry-level passenger van. The second generation Mercedes-Benz Vito design that is more streamlined than its predecessor, powered by a new range of engines, and a rear-wheel drive(RWD) drivetrain. The angle of the windshield and A-pillar is closer to horizontal; the dashboard is bigger and the bonnet (hood) smaller. The new Vito is available in three different lengths and four diesel engine versions: the 109 CDI, 111 CDI, 115 CDI (all powered by a 4-cylinder 2.2-litre engine) and the 120 CDI (featuring the 3.0-litre V6 unit). The model numerics relate to their engine power output: currently the 109 has 95 PS (70 kW; 94 hp), the 111 has 116 PS (85 kW; 114 hp), the 115 has 150 PS (110 kW; 148 hp), and the 120 has 204 PS (150 kW; 201 hp). Blue-efficiency technology is optional. The vehicles have a new 6-speed manual gearbox gear ratios designed for fuel economy. The second generation Vitos are Euro 3 compliant (additionally Euro 4 compliant as of November 2006) and exempt from the Low Emission Zone in London, which requires commercial vehicles (vans) to reach at least Euro 3 standard from October 2010. In August 2008, a variant of the Vito was approved by the Public Carriage Office for use as a licensed London 'black cab'. The Vito taxicab includes electric sliding doors, electric steps and seating for six people. The Vito's rear-wheel steering enables it to meet the PCO's strict Conditions of Fitness requirements including a 25 ft (7.6 m) turning circle and wheelchair accessibility. The vehicle, a variation of the 'Traveliner' model, is built by Penso in Coventry. The rear wheel steer system is licensed from one80, and it is distributed through Eco City Vehicles subsidiary KPM-UK Taxis. The new Taxi does not perform the famous U-turn in the same way as the TX and Metro models[clarification needed], instead it incorporates an electrically operated rear wheel system, activated by a button adjacent to the steering wheel. This turns the rear wheels in the opposite direction to the front wheels, thus allowing the Taxi to perform the same tight turning circle as the TX and Metro models. This system is only possible when the vehicle is traveling at less than 5 mph (8.0 km/h), and if the vehicle goes over this speed while the LSM is active, it is deactivated, and the wheels straighten up. It is longer and wider than the TX models, but traveling through tight spaces is aided by the electric folding wing mirrors, which as of 2009 are standard. In some countries a camping derivative is available - known as the Marco Polo - equipped with a galley (including gas stove, sink, 40 L fridge, and storage), multi-function wardrobe and a sliding bench seat in the rear which can be turned into a large air-sprung bed. A pop-up roof is also standard (electric assist is optional) providing standing height inside. An additional bed can be fitted in the pop-up roof area to increase sleeping capacity to four individuals. Fresh water and waste water tanks are accessible from outside the vehicle, while the gas-cylinder bay is hidden inside an interior cupboard. An auxiliary battery is included under the front passenger seat. Up to six optional individual seats can be fitted for maximum MPV flexibility, but only four seats (including the two-seater bench mentioned above) can be used when in camping mode. The Marco Polo was designed and created in partnership with Westfalia just like Volkswagen camper vans were until 1999. It was then Daimler AG bought a controlling stake in the conversion company meaning Volkswagen had to continue converting their commercial vehicles into camper vans alone. This edition was only available in European markets from 2008 to 2010 with either a petrol or diesel V6 engine. It was available in either Brilliant Silver or Obsidian Black metallic paint, and featured a redesigned radiator grille, 18-inch alloy wheels, a chromed exhaust tailpipe, side skirts, and unique front and rear bumpers. The interior had pebble or anthracite coloured 'Twin' leather seats and a choice of grey or brown burr walnut wood accents. Two head-on airbags and (on higher trim levels) front side airbags are fitted as standard, with front window airbags available as an option. Electronic stability control (ESP), traction control system (ASR), anti-lock braking system (ABS), electronic brakeforce distribution (EBV) and brake assist (BAS) are all fitted as standard. If BAS is activated, the hazard lights flash to warn following motorists that the Viano driver is undertaking an emergency braking manoeuvre. Each seat is fitted with a three-point seatbelt with belt tensioner and force limiter and an adjustable head restraint. The Australasian New Car Assessment Program (ANCAP) also tested the Viano and gave it a score of 32.66 points out of 37. It is the only van in Australasia to achieve the maximum five-star rating. The Mercedes-Benz Viano has received mixed to positive reviews from the motoring press. The van-based design is seen as a blessing by some critics and a failing by others. As of July 2010 reviews for the facelifted Viano are not available. 'Pros: Capable of carrying eight in comfort, massive and versatile interior, superb diesels'. "Most MPVs never make that much sense because when full of people there's nowhere for the lugagge to go. No such problem exists with the vast Viano." 2006: The Viano was a support vehicle in the Dakar Rally for the Mercedes-Benz Service and Kwikpower team 2009: The Viano claimed victory in the SUV category in the 19th Rallye Aicha des Gazelles with Irishwoman Jeanette James as pilot and Frenchwoman Anne-Marie Ortola as navigator. On 16 April 2010 the assembly of the Viano W639 began at the Fujian Daimler Automotive plant in Fúzhōu, China. Forty per cent of the components and automotive parts of the Chinese model version are manufactured by local companies. The Chinese model was launched on the Chinese (Hong Kong, PRC and Republic), the South Korean and Southeast Asian market in April 2010. Changes to the Viano range include standard BlueEFFICIENCY technology, new interior trim materials, new ambient lighting system with dimmable individual LED reading lamps and fibre optic units, optional rear seat entertainment system, redesigned cockpit, new suspension with front and rear axles revised and specially tuned to match each specific model and EU 5 emission standards compliance. The face lifted range included four and six-cylinder diesel and petrol engines rated at 100 kW (134 hp; 136 PS) to 190 kW (255 hp; 258 PS) (CDI 2.0, CDI 2.2, CDI 3.0, 3.5). A four-wheel drive (4MATIC) is optional on models with 4-cylinder diesel engines. In normal operation the system transfers driving power in a 35:65 split between the front and rear axles. The 4MATIC system does not have mechanical differential locks, but an electronic traction system (4ETS). If one or more wheels loses traction on a slippery surface, the system applies brief pulses of brake pressure to the spinning wheels thus increasing torque to wheels with good grip. Vehicles with four-wheel drive have a higher ride height, which increases approach, departure and breakover angles (20°/28°/19° respectively, versus 14°/22°/14° in conventional rear-wheel-drive models). The all-wheel drive adds 80 kg (176 lb) to the total weight of the vehicle. The facelifted version of the Vito began from September 2010, and features restyled front and rear lights, restyled front bumpers, and more-efficient diesel engines adapted from the Mercedes-Benz Sprinter range. The Vito's suspension, instrumentation, steering wheel, and overall quality of materials was also improved. Early models included Vito 110 CDI, Vito 113 CDI, Vito 116 CDI, Vito 122 CDI, Vito 126, with 3 body lengths (compact, long, extra-long). The E-Cell was unveiled in 2010 Post Expo, powered by a 36 kWh lithium-ion battery located in the underfloor unit, electric motor rated 81 PS (60 kW; 80 hp) and 280 N⋅m (207 lb⋅ft) of torque. In 2012 a seven-seater Vito E-Cell was unveiled at the 2012 Geneva Motor Show with electric motor (60 kW (80 hp), 280 N⋅m (207 lb⋅ft)), power electronics, transformer and AC/DC charger under the bonnet; lithium-ion batteries under the passenger compartment floor. The Vito E-Cell is the first electric vehicle mass-produced in Spain. It will be fabricated by Mercedes-Benz Spain, in the factory of Vitoria-Gasteiz. The first manufactured units (91 already) were presented on 7 February 2011. The goal is to produce 474 units by the end of the year. Most of them will be sold to foreign companies (mainly in Germany; Berlin and Stuttgart), though the Basque supermarket gamble Eroski has got four vans for distribution duties. Last year, the government made a plan in order to encourage this kind of cars. 590 million € will be funded, from which 7 have gone to the 'E-Cell' project. This project will also be supported by the Basque and German governments. Mercedes-Benz has chosen its Spanish factory in Vitoria for fabricating exclusively this van, which will substitute the current models Vito and Viano (the commercial-transport and passenger-carrier versions, respectively). Mercedes-Benz expected 100 vehicles to be produced by the end of 2010 and a further 2,000 by the end of 2011. The Vito E-Cell utilizes a front-wheel drive setup to save installation space for a 36-kWh lithium-ion battery pack housed underneath the van's cargo area. The E-Cell's electric motor has 60 kW (80 hp) and 280 N⋅m (207 lb⋅ft) of torque. The electric van has a range of 81 mi (130 km) and a top speed of 50 mph (80 km/h). The UK market was allocated 50 vehicles for the first year. All customers are to be vetted to ensure suitability and must return the van after four years to Mercedes. The Vito E-Cell is a long van, with a distance of 3.2 meters between the axes, so that there is enough space for the batteries. With this aim of saving space, only the front-drive version is offered, unlike in the previous model, so a long development was needed, although some suspension components of the AWD (all-wheel drive) version were used. The vehicle has a payload capacity of 900 kg (1,984 lb), and a permissible total weight of three tons (3.050 kg, exactly). The car does not show external changes with the other versions (except for the decoration): the body has not been modified, both the double side door and the helpful back 'gate' remain as before. The place for the refueling has also been used for the recharging connection. The Vito E-Cell has got a complete and modern equipment. Among the main novelties, this model has a special heater connected to the high voltage network and to the basic heating system, in order to ensure pleasant conditions even in the coldest months. In terms of safety, the new Mercedes keeps the same level as the other Vito models. The vehicle has an internal combustion engine, so, if a collision occurs, the batteries are protected by a shock element. The active safety also makes that the high-technology voltage network turns off when the airbag control unit activates. The Vito E-Cell comes standard with the Electronic Stability Program (ESP) and dual airbags. This van is driven by an electric battery. This battery is placed under the chassis (where the petrol tank and the prop-shaft are normally), while the engine, the transformer and the charger are located in the engine's (a block of four or six cylinders) usual position, under the hood. The battery consists of a Lithium ion battery pack split into 16 modules with 192 cells in all, with high energy density and a rated voltage of 360 volts. They are supplied by the company Magna, and they have a maximum range of 130 kg (287 lb) (just as the engine), but this can be reduced by the weather conditions, the ground's topography or even the cargo volume. It is considered that a range between 90 km and 100 km could be more realistic. Either way, it is supposed to be enough for a workday in urban delivery. The batteries weigh 550 kg (1,213 lb); their life is unknown. Their total charge time is six hours through a high voltage system (380 or 400 volts); with a domestic 230 volt supply the total charge time is double, about 12 hours. The total battery capacity is 36 kWh, 32 kWh are available for the vehicle operation. Moreover, Mercedes-Benz offers the vehicle in the form of 'renting', in which the manufacturer takes charge of updating the batteries when necessary. The electric engine is a permanent synchronous magnet drive with a constant power of 60 kW (80 hp; 82 PS) and a maximum power of 70 kW (94 hp; 95 PS). The top speed is limited to 80 km/h (50 mph), and it has a maximum torque of 280 N⋅m (207 lb⋅ft) instantly available, which lets the van have a similar dynamic performance to one equipped with a modern diesel engine. Vito E-CELL 2010- Electric motor () continuous: 81 PS (60 kW; 80 hp)@?, 280 N⋅m (207 lb⋅ft)@? maximum: 95 PS (70 kW; 94 hp)@? Beginning with September 2011, BlueEFFICIENCY models of Viano and Vito include a new generator management system converts part of the kinetic energy produced into electric energy, which is then stored in the battery. All Viano and Vito engines conformed to Euro 5 emission standards. During 2013 a number of special editions were launched; including the Grand Edition Viano launched at the Geneva Motor Show. Two special version for the Japanese markets were launched the V350 White Edition (50 units) and Black Edition (170 units) with additional equipment, large alloy wheels and leather interior. Two updated camper vans were launched at the 2013 Caravan Salon; the Fun and Marco Polo. UK models included only 2.2 CDI (long/extra long), 3.0 CDI (long/extra long). As of 14 November 2013, Daimler's van joint venture Fujian Benz Automotive Co. (FBAC) has secured an order by the Dalian Wanda Group comprising 85 Mercedes-Benz Viano 3.0L vans. The third generation V-Class was launched in 2014 as a full size MPV to replace the Viano and R-Class. However, it was marketed as a successor to the Mercedes-Benz Viano. Sales commenced in Germany in May 2014, with European sales following in June. The car is sold in the United States and Canada as the Mercedes-Benz Metris since 2015 as a 2016 model year. At the time of its introduction it was the least expensive starting price for a new Mercedes-Benz model in the United States according to Car and Driver magazine. The V-Class was a long-wheelbase model initially, with compact and extra-long variants due at a later date. A special launch model based on the V 250 BlueTEC is called Edition 1, and is fitted with a range of additional equipment including leather interior, Burmeister sound system and large alloy wheels and Agility Control suspension system. Changes to Vito included standard Attention Assist and Crosswind Assist, optional Intelligent Light System (LED indicators, LED daytime running lamps, LED low-beam headlamps, main beam with cornering light function). Production of V-Class in Vitoria, Spain plant began in March 2014, followed by Mercedes-Benz Vito in autumn 2014. Also, it started production in Argentina and production at the Fujian Daimler plant in Fúzhōu, China started in March 2016. BlueEFFICIENCY package is standard on all versions of V-Class featuring the 7G-TRONIC PLUS automatic transmission and is optionally available for all variants with 6-speed manual transmission. Blue Efficiency package is available for Vito with OM 651 engine and rear-wheel drive, and standard for all Vito models with automatic transmission and a car registration. Overboost is available for vehicles with 7G-TRONIC PLUS transmission and AGILITY SELECT, with transmission mode set to "Comfort" (C), "Sport" (S), or "Manual" (M). V-Class with 7G-TRONIC PLUS transmission includes optional AGILITY SELECT system with 4 transmission modes ("ECO" (E), "Comfort" (C), "Sport" (S) and "Manual" (M)). ^ "Mercedes-Benz Vito" Archived 2 February 2017 at the Wayback Machine. Press Porsche. Retrieved 2 June 2014. ^ "Mercedes-Benz UK - Overview - Design". .mercedes-benz.co.uk. Archived from the original on 24 July 2010. Retrieved 4 July 2010. ^ "Mercedes-Benz UK - Overview - Design". .mercedes-benz.co.uk. Archived from the original on 23 June 2010. Retrieved 4 July 2010. ^ "Mercedes-Benz UK - Viano - Technical data". .mercedes-benz.co.uk. Archived from the original on 19 June 2010. Retrieved 4 July 2010. ^ "Mercedes-Benz UK - Lines and equipment - Standard equipment". .mercedes-benz.co.uk. Archived from the original on 14 May 2010. Retrieved 4 July 2010. ^ "Mercedes-Benz Viano MPV 3.0 CDI Ambiente SWB 5dr - Car Comparison - What Car?". Whatcar.com. Archived from the original on 27 July 2011. Retrieved 26 September 2010. ^ "Public Carriage Office notice at Transport for London" (PDF). Archived from the original (PDF) on 14 July 2014. Retrieved 8 July 2014. ^ "Mercedes-Benz UK - Viano - Viano X-CLUSIVE". .mercedes-benz.co.uk. Archived from the original on 1 April 2010. Retrieved 4 July 2010. ^ "Mercedes-Benz UK - Viano - Viano X-CLUSIVE". .mercedes-benz.co.uk. Archived from the original on 23 June 2010. Retrieved 4 July 2010. ^ "Mercedes-Benz UK - Overview - Safety". .mercedes-benz.co.uk. Archived from the original on 6 January 2010. Retrieved 4 July 2010. ^ "Mercedes Benz Viano | Euro NCAP - For safer cars crash test safety rating". Euro NCAP. Retrieved 4 July 2010. ^ "Mercedes-Benz safety | Viano crash test". ANCAP. Archived from the original on 6 March 2012. Retrieved 14 August 2012. ^ a b c "EcoTest". Ecotest.eu. Retrieved 1 February 2011. ^ a b "MERCEDES-BENZ Viano CO2 Emissions – MERCEDES-BENZ Green Ratings at Next Green Car". Whatgreencar.com. 3 December 2009. Retrieved 20 July 2012. ^ "Car Reviews: Mercedes-Benz Viano 3.0 CDI X-CLUSIVE - Long". The AA. Retrieved 4 July 2010. ^ "Prices and Specs Editions". Autocar. Archived from the original on 1 December 2008. Retrieved 4 July 2010. ^ "New Mercedes-Benz Viano Car Review - Parker's". Parkers.co.uk. Retrieved 4 July 2010. ^ "Mercedes-Benz Viano Review - Car Reviews". RAC. Archived from the original on 23 July 2011. Retrieved 4 July 2010. ^ "Mercedes-Benz Viano MPV - Readers Reviews - New Car Review - What Car?". Whatcar.com. 23 May 2005. Retrieved 4 July 2010. ^ "Mercedes Viano Range : VIANO IN THE DARK? - Yahoo!! Cars". Yahoo!. Archived from the original on 16 February 2007. Retrieved 4 July 2010. ^ "Review of the new Mercedes-Benz Viano Range". Buyacar.co.uk. 6 March 2006. Retrieved 14 August 2012. ^ a b "Mercedes-Benz Viano 4MATIC class winner in women's rallye | Daimler Global Media Site > Mercedes-Benz Vans > Viano". Media.daimler.com. 8 April 2009. Archived from the original on 8 July 2011. Retrieved 4 July 2010. ^ 福建戴姆勒汽车工业有限公司 (in Chinese and English). Fujian Daimler Automotive. Archived from the original on 9 February 2014. Retrieved 17 August 2010. ^ "New Mercedes-Benz Viano Van Offers Comfort and Efficiency". eMercedesBenz. Retrieved 4 July 2010. ^ "Mercedes-Benz Viano 4MATIC: traction, comfort and safety in perfection". media.daimler.com. Retrieved 6 August 2011. ^ "Mercedes-Benz Vito New-Generation Sets New Benchmarks in Vans Segment". Mercedes-Benz. 2 July 2010. Retrieved 17 August 2010. ^ Abuelsamid, Sam (30 July 2010). "Mercedes-Benz introduces new Vito E-Cell van – Autoblog Green". Green.autoblog.com. Retrieved 17 August 2010. ^ Eric Loveday (4 May 2011). "Europcar to offer Mercedes-Benz Vito E-Cell electric van rentals". AutoblogGreen. Retrieved 10 June 2011. ^ Van Locator (1 July 2011). "Mercedes-Benz Vito E-Cell Hits the UK". Focus Publishing. Retrieved 10 July 2011. ^ "New Vehicle Security Ratings". Thatcham.org. Archived from the original on 2 August 2011. Retrieved 14 August 2012. ^ "Mercedes-Benz Metris - Car and Driver". caranddriver.com. Retrieved 8 June 2016. Wikimedia Commons has media related to Mercedes-Benz Vito.